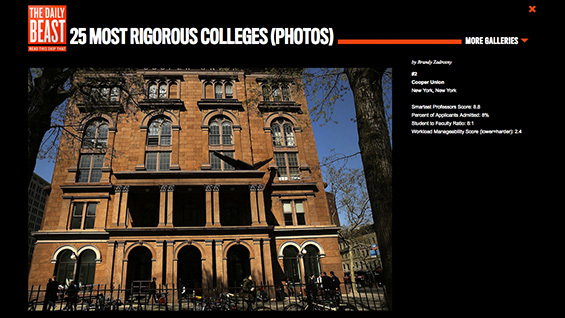 Cooper Union Ranked in Top Three "Most Rigorous" Colleges in U.S. The Cooper Union ranks as one of the top three most rigorous colleges in the country, along with Columbia University and the University of Chicago, according to The Daily Beast. In the 2014 annual "Guide to the Best Colleges" the online news site also ranked The Cooper Union in the top ten schools that offer the best return on investment, as well as naming it one of the most affordable schools nationwide. The Daily Beast ranked The Cooper Union second in its list of the "20 Most Rigorous Colleges." It determined its rankings by analyzing the selectivity of admissions, student-to-faculty ratio, class size and student surveys for workload manageability and smartest professors. The Cooper Union was also ranked #7 on The Daily Beast's list of schools that offer the best return on investment. "Students consistently rate gaining lucrative employment as the most essential factor in deciding where to go to college," Brandy Zadrozny writes in the introduction to the list. "With that in mind, The Daily Beast wanted to find which schools offered students the best opportunity to make money in the future without shelling out too much upfront." The rankings were determined by average net cost to students as well as the average starting salary ($61,100) and average mid-career salary ($117,000) of graduates according to Payscale.com. The Cooper Union also ranked in the list of most affordable schools in the nation, at #21, marking the fourth time the institution has appeared on such a list in 2014. The U.S. News & World Report Best Colleges 2015 guide, put The Cooper Union as #1 on its Best Value list, after The Princeton Review and Money magazine had also ranked it in their top ten best value lists.